It was a joy to see AFSA members featured at Nationals Park on Sept. 30 and to hear the announcer explain to the crowd that members of the Foreign Service protect and serve America’s people, interests and values all around the world. A member of the West Point Alumni Glee Club, on the baseball field with us to sing the national anthem, thanked me for my service. I felt appreciated and proud, and I hope the 500 members of the FS community who participated in Foreign Service Night felt the same way. I would like to do more of this sort of thing, but we will need your continued support to make a success of the ambitious outreach plans we are developing at AFSA. AFSA members, especially retirees, have a long and distinguished record of generous giving. 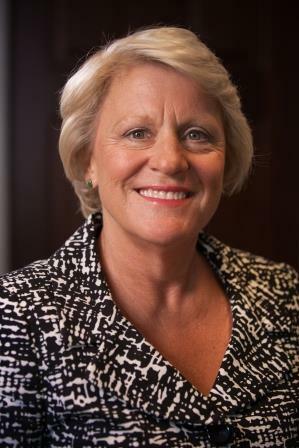 This is seen most clearly in the spectacular success of the AFSA Scholarship Fund, which has grown from $2 million in 1995 to $8 million today. With dedicated, effective AFSA staff support and a clear message about what the 501(c)(3) nonprofit fund supports—merit and need-based college scholarships for children of AFSA members—the Scholarship Fund is now on firm footing to continue to fulfill its mission in perpetuity. Assuming a 5-percent annual draw, the fund will generate approximately $400,000 each year—more than enough to cover the costs of scholarships AFSA gives to nearly 100 students each year. 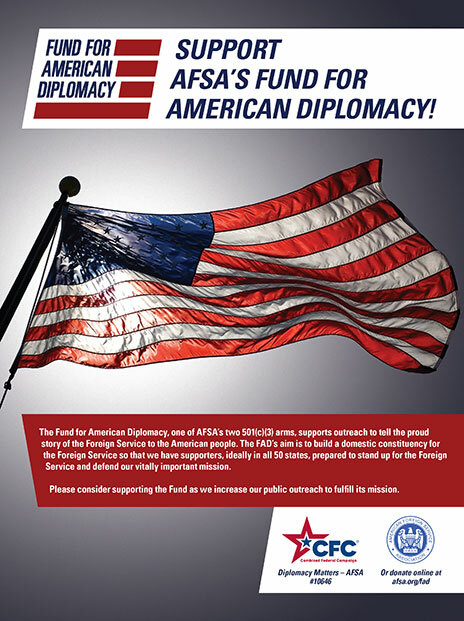 With scholarships secure, we now intend to pivot our fundraising efforts to the Fund for American Diplomacy, AFSA’s other 501(c)(3) nonprofit arm, in support of ongoing and expanding outreach efforts to tell the proud story of the Foreign Service to the American people. In his column this month, Retiree VP Tom Boyatt urges members facing required minimum distributions to contribute this year to the Fund for American Diplomacy. The FAD’s aim is to help build a domestic constituency for the Foreign Service so that we have supporters, ideally in all 50 states, prepared to stand up for us and defend our vitally important mission. We plan to channel lessons learned from the success of the Scholarship Fund into making a success of the FAD. The first lesson is that we need dedicated staff and a clear message about how the funds will be used. In my October column, I described forging strategic partnerships to serve as the foundation of our outreach efforts to tell our story across the 50 states. As we build out that effort, though, it is clear that what we should say to inner city high school students about the value of the Foreign Service is not the same as what we should say to the Colorado Farm Bureau or to elite students at Georgetown’s School of Foreign Service, or to military or business audiences. 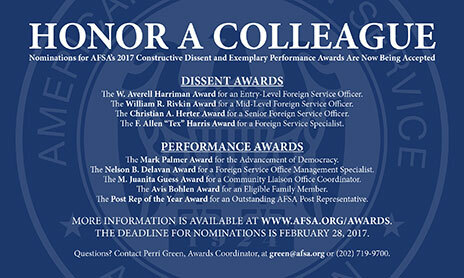 A key element of the AFSA outreach effort, therefore, is to curate a library of speaking materials to help members explain in concrete terms to a wide range of audiences why a strong, professional, nonpartisan, career Foreign Service matters to them and deserves their full support. We will need dedicated staff to build that library and to coach and prepare speakers to connect with audiences. And we will need you to contribute, drawing on your own experiences—what worked (and did not work) when you last spoke to your alma mater, your hometown Rotary Club, or to a local World Affairs Council? Other elements of the outreach strategy include expanded use of a new edition of AFSA’s hugely successful book, Inside a U.S. Embassy, which has sold more than 120,000 copies. The revised edition will include new material showing how the presence of career Foreign Service professionals at embassies around the globe benefits Americans from all walks of life—travelers, business-people, researchers, missionaries, voters. With completion of the digitization of The Foreign Service Journal, those writing about American diplomacy will have ready access to primary source material dating back to 1919 showcasing the central role of the Foreign Service in American diplomacy and history. I will continue to keep you informed as AFSA’s outreach strategy takes shape and scores successes. And I will continue to ask for your support and engagement. We can do this!